The Protect North Carolina Workers Act is one of the remaining piece of legislation on the governor’s desk, following the nine month session. And before deciding whether the bill should become law, Susan Ladd says Governor McCrory should consider the confusion this bill will create at the county level. Case in point: House Bill 318, which among other things, banned consular cards and IDs created by communities or nonprofits, such as the FaithAction IDs, as acceptable forms of identification. Guilford County Register of Deeds Jeff Thigpen and other registers of deed across the state are scrambling to figure out whether they are bound by the language of this bill and how they will deal with Hispanic residents seeking marriage licenses and birth certificates for their children if Gov. Pat McCrory signs it into law. The vast majority of Hispanics use — you guessed it — consular IDs to apply for both these vital documents. 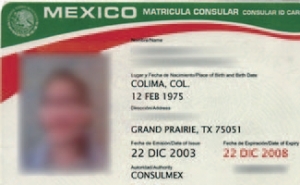 His office conducts an average of 20 marriages each day, and Hispanics using consular cards account for several of those. There is no explicit guidance in existing statutes about what kind of identification the register of deeds office can accept, but most offices use a common set of guidelines. House Bill 318, however, covers “any government official,” which likely would include employees of the register of deeds. For Thigpen, it’s another headache from a legislature that is focused more on its next election slogan — “I’m tough on immigration” — than the practical effects this bill might have. Later this month representatives from Charlotte, Winston-Salem and Greensboro will gather to discuss the future of the city issued IDs for immigrants. You can read Ladd’s full column here.